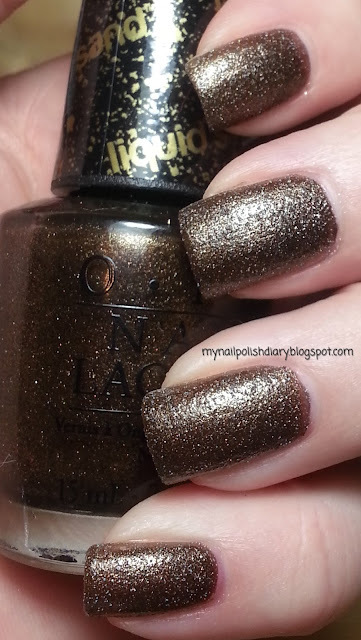 My Nail Polish Diary: OPI What Wizardry Is This? Another textured polish. What can I say? I love them! OPI What Wizardry Is This? is from the Oz The Great and Powerful Collection just released this spring. I actually wore this to go see the movie ;) I liked the movie a lot. I like the polish even more! What Wizardry Is This is a bronzy brown with golden textured effect. It's really unique and pretty darn amazing. The wear was great and the application was as well. Dry time is a little slow. I think I gave it a good 45 minutes to fully dry. That's about 15 minutes more than the other textures I've worn, but the pay off is well worth it.